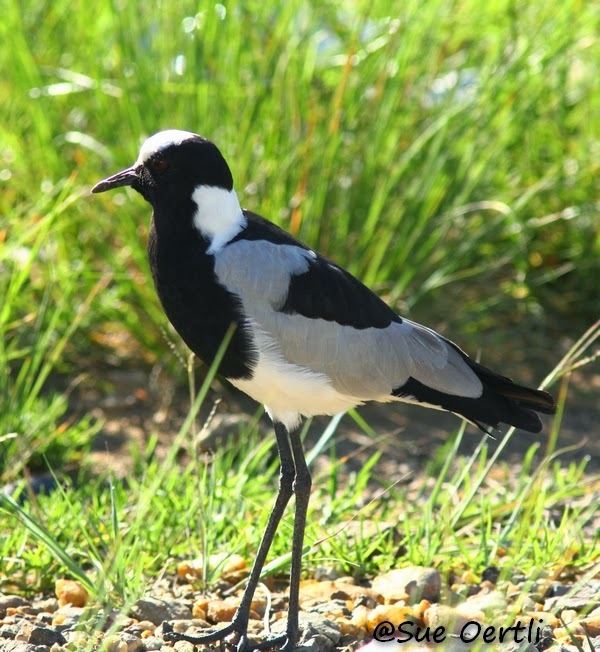 Wader Quest: Gauteng Challenge 2014 update N° 1. Gauteng Challenge 2014 update N° 1. She is raising money for the WWT Spoon-billed Sandpiper captive breeding programme via Wader Quest by being sponsored to photograph all 40 wader species that occur in the greater Gauteng area in 2014. Sue, seen here sporting a rather fetching Wader Quest T shirt, has hit the ground running in her attempt with her first outing which produced four species. 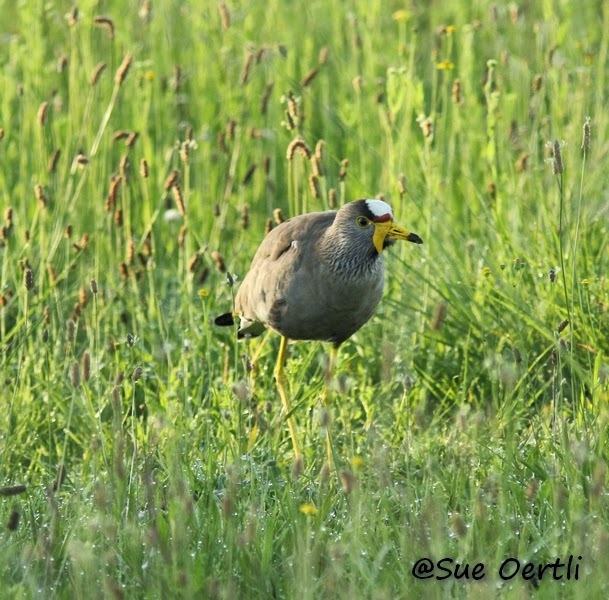 The first was African Wattled Lapwing which she spotted along the grass verge of the main road in Randburg. The second was Blacksmith Lapwing which she saw within 500m of her home in Fourways. 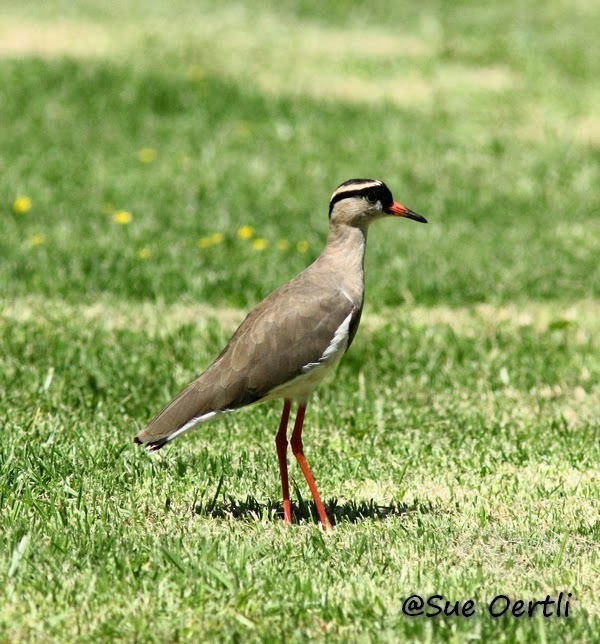 The third was Crowned Lapwing in the Walter Sisulu Botanical Gardens amid a morass of people, prams and children passing close by, it was much quieter on the day we visited with Sue back in September. The gardens were particularly memorable for us as we saw this and the two previous species together on the lawns (not to mention the Verreaux's Eagle nest). 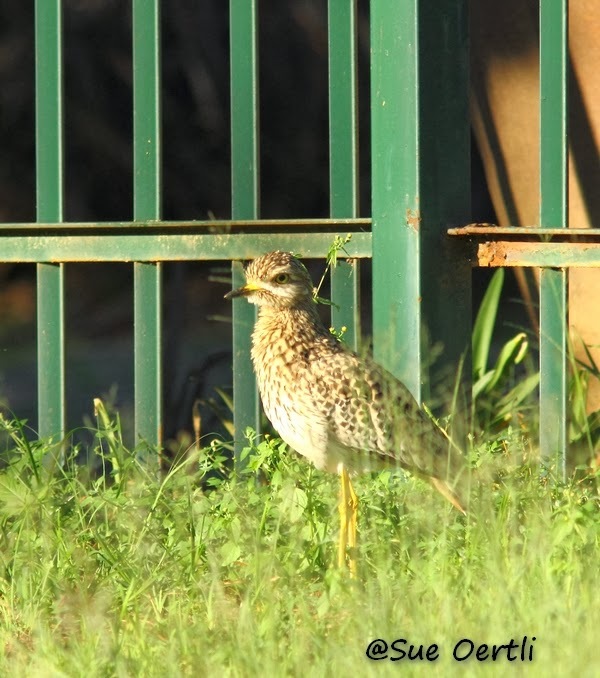 The last species of the day was Spotted Thick-knee which she found at a place called Golden Harvest Park in Randburg. When we were with her we tried to find these birds but were unlucky, however I certainly recognise that fence, which I spent some time looking at in the vain hope that one was hunkered down underneath it! We did of course see Spotted Thick-knees elsewhere, but this chap eluded us. 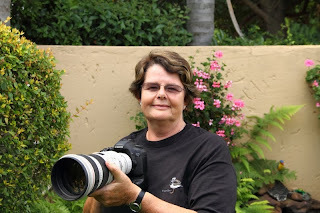 Sue has 40 species to find and photograph in 2014 so this haul means she has already covered 10% of them! Gauteng Challenge species total 4.